Good morning my friends, and I'm happy to report that I had a restful and refreshing weekend. Shortly after I recorded Tea Time on Thursday (special edition with Typhoid Tiffany :0) it became abundantly clear that I was not suffering from mere seasonal allergies. I had something much more virulent, and I was feeling pretty collapse-y as a result. But no rest for the weary, as with all 6 of us teaching in the exact same time slot on Friday mornings, calling in sick is really not an option this semester. So there I was Friday morning, teaching with a voice that could barely be heard above the rasp factor, terrible congestion, and a fever rash covering my neck, chest and upper arms that drew any number of alarmed stares. Let's just say that RESENTMENT was an emotion that I was struggling with as the week ended. By the evening, I could barely talk, let alone dance, and so going to rehearsal was out of the question. I was pretty surly as a result. I took the weekend as a time of serious reexamination and reflection. I have a lot going on right now, it is true, but so does everyone else. I need to be able to deal with things better. Happiness isn't all external; it is a state of mind, and I need to adjust mine. I came up with some ideas, which I will go into tomorrow. And my task is to carry them forward with me each and every day. I'm off from in-person teaching this week and next, but I still have many more teaching weeks ahead of me. I also have the grading monster to slay during these online weeks, plus lots of writing to do. I needed to find a way to balance all of the things I'd like to get done in a day (teaching/other work tasks, family time, writing, blogging, exercising, prayer) and so far, what I was doing wasn't working. I was getting things done, but I was miserably unhappy. I want a way of life that will allow me to treasure the small moments, and carry that happy place with me into the chaos of the teaching weeks. I also need some semblance of a prayer life to sustain my soul ALWAYS. I have some ideas. Check back tomorrow and we'll chat. ;-) In the meantime, today is my September Catholic Mom day, and today we chat about holy reminders and prayer cards. 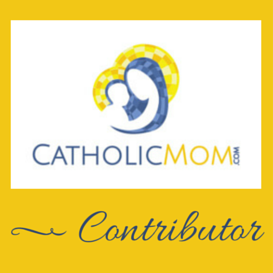 I would LOVE for you to leave me a comment over at Catholic Mom! Until tomorrow my friends. I'm blowing a kiss to you all!